The Mad Hatter and Mercury Poisoning - Why Kan’t Doc Zoe Write? I am so elated that one of my favorite directors, Tim Burton, is making his own version of Alice in Wonderland. And that it would be showing in 3D is an added bonus. I want to be transported to a world where everything is believable, and with Burton’s vision, I want to believe in a magical and slightly twisted world. 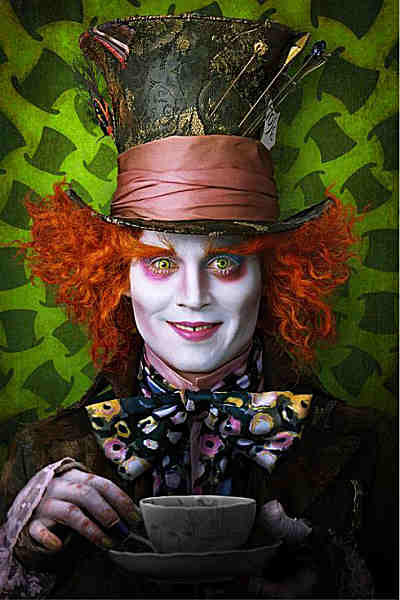 In this new version, the Mad Hatter is probably someone whom you won’t describe as only “slightly twisted.” Johnny Depp plays the orange-haired character and believes the Mad Hatter is “very, very poisoned.” He says that in his research, he says that in the 18th and 19th century, mercury was used in the hat-making process. It was, thus, quite probable that mercury has seeped through the skin of hatters, affecting them physically and mentally. Let’s look deeper into this. Where exactly has this come from? The origins of such phrase vary, according here, here, and here. All three sources agree that the phrase has been existing since before Alice’s time. So what is the truth behind hatters’ madness? How were top hats made? According to this, in the 18th and 19th century, rabbit fur or beaver fur were used for making hats. These were treated with an orange solution called mercury nitrate in a process called carroting. This was to roughen it so that it could be shaved off, forming the felt. The hat-makers would be inhaling the fumes coming from this process, and with prolonged exposure (especially those involved in carroting) would manifest with symptoms of mercury poisoning. Back then, they were known as mad hatter syndrome. What would these symptoms be? Amnesia, retrograde or anterograde or both. Retrograde amnesia is a form of amnesia where someone will not be able to recall eventst that transpired before the development of amnesia. On the other hand, anterograde means that he would be unable to form new memories. and confabulation (making up stories from invented memories which they believe are real due to memory gaps brought about by black outs). Most of these symptoms have been associated with the Mad Hatter character (or at least that’s what I remember from the classic Disney animation). I never thought of looking the origins of the Mad Hatter’s madness especially since it has been locked in my memories that the story of Wonderland was just something fabricated in Lewis Carroll’s imagination. At least now I can see the Mad Hatter’s eccentricities as coming from medical condition I believe is possible. No wonder he’s a mad hatter! Must’ve been some mercury in his cup o’ tea.